Whilst Up in Scotland supporting Karl with his west highland way race attempt, I just had to squeeze in a bit of hill time. 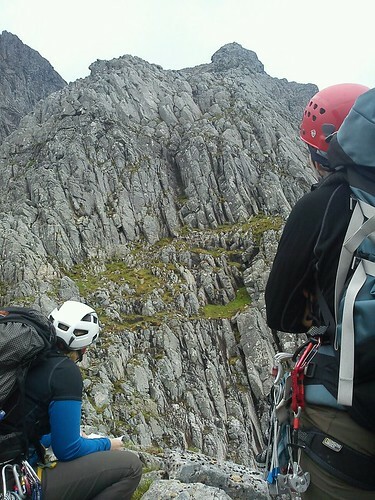 Cath was pretty keen for Tower Ridge, and I was keen to make my first time on ‘The Ben’ special; so that’s a plan! Just left to rope in Susie in for a touch of local knowledge and some gear and we had a team. After the weekend’s persistent rain, Tuesday’s forecast look positively good. Knowing the morning capabilities of our group packing the night before was deemed wise; sitting around catching up on gossip over a bag of gear and guidebooks. Still not what you’d call and alpine start but only 30mins later than the 9am plan. A sunny walk up the Allt a Mhuillin, and never having been anywhere near Ben Nevis before my eyes were taking it all in, Susie pointing out options for ways down and other routes up the hill. Lunch gave us time to check out our objective, pretty awe inspiring. We ended up going quite high on the approach path, before contouring in to the approach gully, but it worked out OK as there was a nice big ledge to stop and put harnesses etc on. We used the route description from Dan Bailieys Scottish Mountain Ridges book for the route itself. We got the rope out for the access chimney, but were soon scrambling off up the ridge after that. We got the rope out again for the slanty ledge, but back to soling after that. We made a few trips along promising looking paths – looking for the eastern traverse – but (correctly) wrote them off as unlikley candidates. When we did find the eastern traverse – leading to the cave it was super obvious, and right below the vertical part of the Great Tower. I felt like I was getting used to the scrambling now – even on easy climbs I would normally opt for my rock boots – but I was starting to use my feet, and move more confidently. 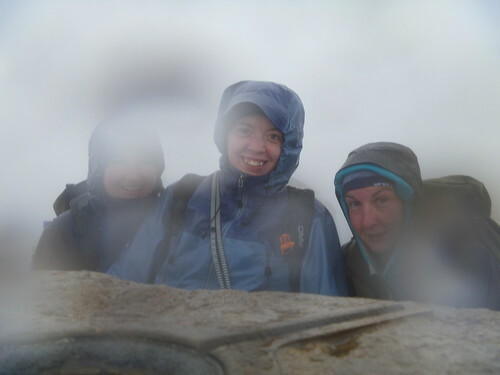 The weather closed in pretty heavily as we reached the top of the Great Tower, and rain started to fall in earnest. Just in time for Tower Gap. We could just about see it as we peered into the mist. Ropes out again. I was secretly a little bit pleased that nobody else was up for leading this. 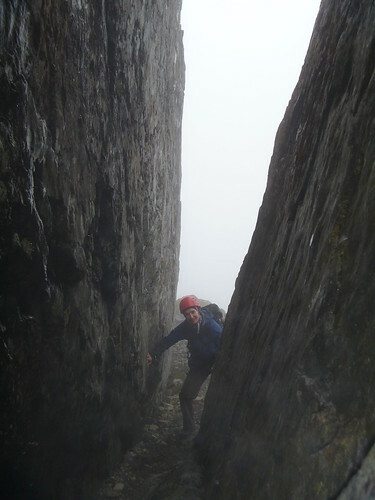 Actually it felt kinda quite easy; one of those reach your tippy toe down moves like the descent from Raven Crag. Then to belay everyone else across and get into warm clothes. The guide suggests striking a macho pose at the top of the route – but there was no one there to see. Instead we had a group hug and giggled a bit. 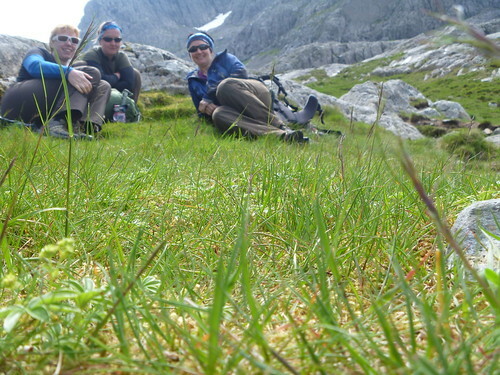 Having come this far we then of course had to make a trip to the summit – where we sat in the refuge and and drank tea. A wet descent down the tourist track to the half way lochan, then following the outflow back down to the top car park, and a slow trudge down to the North Face carpark. Last car in the car park, everyone looking very tired. 10 hours car to car. On the drive home we’d occasionally turn to each other, smile, “hey, we climbed tower ridge”, “giggle giggle”: still doing that now. Great report- sound scary to non- climbers.